Explore and discover our home collections designed for every lifestyle and lifestage. They'll transform the way you live. Our brand new two-storey designs are another great example of our commitment to expanding our range of homes to suit the shifting needs of Australian families and the diverse lifestyles, locations and desires of our customers. Two storey homes have made a huge comeback as they offer a practical, cost effective and flexible living solution in response to rising land costs, the movement towards smaller lot sizes and the shifting needs of Australian families. Two storey homes not only offer striking street presence and help allow you to make the most of your surrounds; they create the perfect symmetry between spaces for privacy and relaxation, and entertainment and communal living areas, so you can really enjoy the best of both worlds every day. So you’ve found your perfect block of land in a great location, but choosing a design that makes the most of the fantastic view is proving harder than you expected. Don’t worry. At McDonald Jones, we understand that the world isn’t flat and sloping home sites come with their own set of challenges. So we put our talented architects to work and they’ve produced a brand new range of stylish split level home designs that look great, feel great and won’t break the budget. live and effectively overcomes the obstacles of a sloping block that a single level design could not. McDonald Jones architecturally designed split level homes all include sensational open plan living and entertaining areas that take in the surrounding views. So if a unique sloping block has captured your heart, McDonald Jones Homes’ new split level designs now offer an affordable architectural option to current alternatives. Spacious and thoughtfully designed architectural homes delivering distinctive style with quality living spaces throughout. This stunning portfolio of new home designs captures the essence of modern living by offering stylish areas which are an expression of the way you live. The Stuart Everitt Design Portfolio offers you the space and freedom to escape from the day to day with inspired layouts offering well zoned areas which are a reflection of architectural good manners. Designs exceed expectations by seamlessly balancing the relationship of indoor outdoor living while still ensuring the home provides an ambience so you can move to wherever the mood takes you. From the moment you step into the wide open entry these new home designs make a statement, you will appreciate that they cater to your exact needs. Discover flowing spaces which effectively connect the home, everyday living and entertaining in absolute style is enjoyable with gourmet kitchens featuring quality inclusions to enhance your lifestyle. The Country Living collection showcases just how comfortable a McDonald Jones home can be. From the easy, free-flowing interiors offering both private, well-appointed accommodation zones and stylish, open plan living areas, these designs leave nothing to chance and integrate thoughtfully with the surrounding terrain, no matter how vast it may be. Our homes celebrate country life, inside and out. 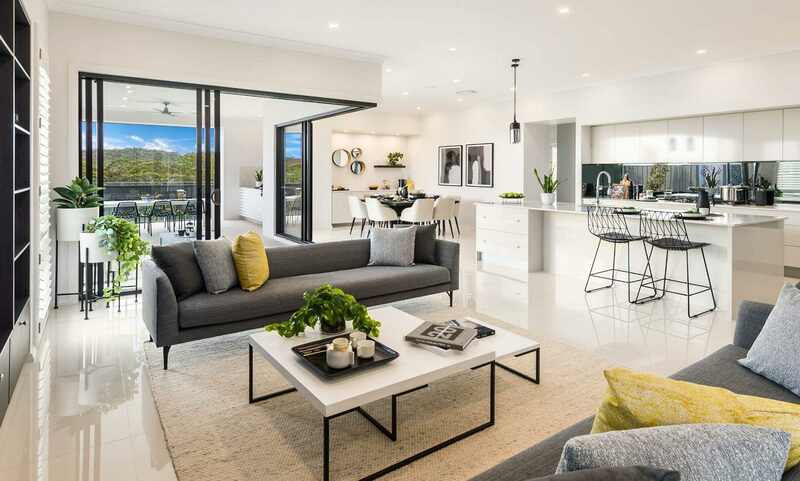 The NextGen Collection of new home designs offers the perfect balance of functional modern living spaces, stylish open plan layouts and spacious alfresco entertaining options. Designs in the NextGen Collection have been created by international Architects Stuart and Justin Everitt and the range of 3 and 4 bedroom new home designs offers families contemporary homes brimming with style and inclusions that reflect true value for money. McDonald Jones has further enhanced our comprehensive collection of house designs with the introduction of a new range of affordable, architecturally designed entry level homes. These innovative and cleverly designed 3 and 4 bedroom homes complement our very successful award-winning NextGen and Stuart Everitt ranges. The GenOne new home designs feature well thought out living areas that provide functionality for everyday living. This range of designs has been developed for anyone looking to enter the market for the first time or families looking to move up to enjoy the benefits of building their very own new home. The versatile designs also cater for people looking to downsize without sacrificing quality living space and the ability to entertain in style. Without compromising on quality, detail or functionality, the contemporary GenOne Collection offers smart designs brimming with style and inclusions not often associated with homes of this size. The NOW Series from McDonald Jones is an affordable range of homes complete with everything you need, and nothing you don’t. These quality made homes are the best money can buy, all at a cheaper price. The homes are the perfect blank canvas for you to start your new life in your new home and make a home that’s truly yours. It’s time to make the move into your own brand home, with McDonald Jones we make it easy for you to start living the great Australian dream. An innovative and modern twist on the popular granny flat, our designs offer an additional level of luxury to enrich your lifestyle options. Our innovative designs offer spacious living and sit perfectly in iconic Australian landscapes. Part of our Acreage Homes collection, the Lyndhurst design is inspired by these ideals, providing 4 bedrooms and an iconic verandah; spaces to live and rooms to relax. Conversely, the Tulloch design, from our Two Storey collection, represents limitless opportunity. Ideal for a smaller block, it’s innovative architecture maximises space, creating a beautiful flow from room to room and also features an optional alfresco perfect for entertaining and relaxing. View our entire collection of new home designs, we’ve got something for every lifestyle and life stage. You’re sure to find your dream home here, start the transformation.